The last U.S. President to be elected with any facial hair was William Howard Taft in 1908. Taft - that was 106 years ago. The higher on the political ladder a man climbs, the less chance a he has being elected to office. Worldwide the percentage of men with facial hair is 50%. In the U.S. and Europe it is 33%. Since the advent and widespread proliferation of photography, the percentage of men with facial hair has dropped. Pre-verbal children overwhelmingly prefer clean shaven men over those with facial hair - even if their father or other male guardian has a mustache, beard or goatee. Human beings are hard wired with this biological bias. All things being equal, those without facial hair are interpreted as more sincere. When trust, negotiation, rapport or sincerity is a key element of any human relationship, statistically a man has a significantly better chance if he is clean shaven. And while there are always individual exceptions, statistics describe the behavior of large numbers. 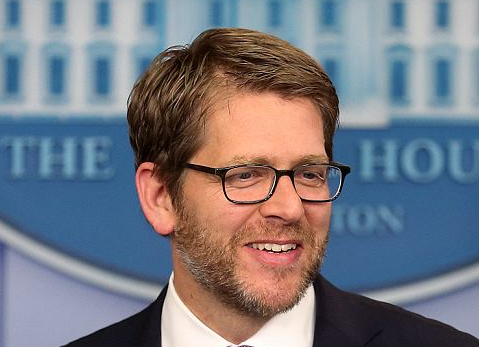 Other than the President, Jay Carney or any press secretary is the most visible member of any administration - thus any male press secretary should NEVER sport facial hair.